This time of year is simply great for photography. On this Saturday, it was a downpour most of the day in Portland, but we escaped to the drier side of the Cascades for a real mix of warm sun, clouds and showers. 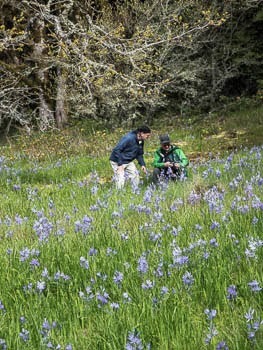 First stop was a beautiful field of Camas along the Columbia River. Clouds and filtered sunlight were fine for bring out the beautiful blue flowers, with green grass and moss surrounded with an oak and fir forest. Katrina moving in for a portrait. 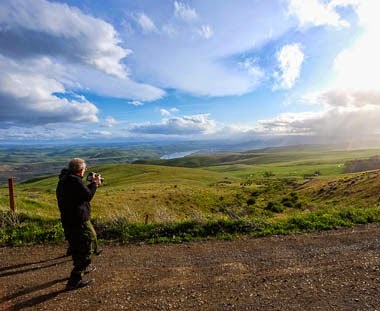 We arrived at our main destination for the day, Columbia Hills State Park, with a crowd of climbers at Horsethief Butte, above the Columbia River. 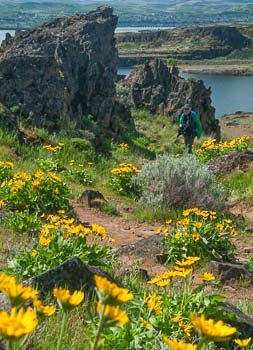 The sun was blazing as we explored various options to shoot the Balsamroot and basalt cliffs. Didn't think we would need sunscreen! 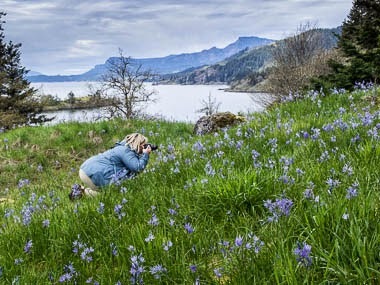 Although there was a lot of activity, there was still plenty of room for making photographs of the flowers and surrounding area. As the weather changed from sun to shower, we headed to The Dalles and lunch at Petite Provence. There is nothing Petite about their entrees. After lunch we reviewed some of the photographs of the morning shoot. 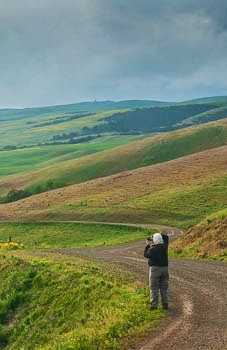 The weather was looking more unsettled as we drove back to Washington and the lovely hills of the Dalles Mountain Ranch. The lupine were just getting started, but the Balsamroot was covering the hills in every direction. We hiked to some vistas, making it back to the van before another shower arrived. We explored the eastern section of this area, then headed back for some very fine vistas, beautiful, fast changing light. What to shoot next? Thanks, Randy. Last stop was back to Horsethief Butte with hopes of some sun on the Butte before it went behind the ridge. 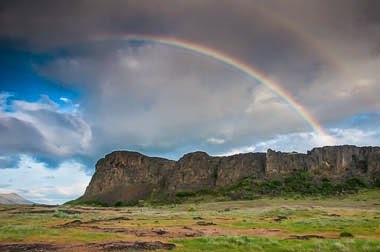 We did have some interesting clouds and a nice rainbow. A very pleasant day of beauty and changing conditions.